It was only a matter of time before we returned to the dark recesses. In many ways “Frame of Mind” is Brannnon Braga's archetypal Star Trek: The Next Generation story. It certainly bears all of his trademarks: A bold and unafraid examination of genuinely dark psychological horror themes done with a deft and ambitious surrealist flair. Braga is also flatly unafraid to throw us some undiluted theory, with copious quotations, citations and visual nods to the work of Carl Jung. It's a candid and refreshing bolt of unashamed intellectualism that goes a long way towards letting us know what Braga thinks his show's audience is like: Star Trek isn't exactly patronizing, or at least not as much as a lot of other television is, but even so it's still rare for it to be this frankly and openly (and literally) philosophical, and every time it happens it feels like this really should be the way the show always operates. Pretty much nowhere else are you going to get a 200-level course on Jungian psychology and dream theory told through a mini piece of abstract sci-fi cinema on primetime television. Braga's debt to his idol David Lynch is certainly on display tonight. We wouldn't expect to see blatant body horror on Star Trek: The Next Generation (...yet), but the suitably dreamlike (or should I say nightmarish) flow to the story brought exquisitely to life through James L. Conway's direction remains undeniably Lynchian, and also very, very Brannon Braga. And yet in spite of the entirely deserved wild acclaim this episode gets from fandom (it's yet another stellar highlight of an absolutely astronomical creative period), when you sit down to watch “Frame of Mind” it actually comes across as one of Braga's more restrained and subdued offerings: As haunting as the concept of perceptive reality being in constant flux and turmoil is and as absolutely gripping as Jonathan Frakes is as the beleaguered Will Riker (unquestionably one of his absolutely finest hours on the series, end of: Frakes should have at least been nominated for something), the central premise remains surprisingly pedestrian, at least by Braga standards. As the series is obviously not going to undo six years of character development and world building in 45 minutes, we know from the start the “real” world is the Enterprise, or some manifestation of it. The game then becomes trying to guess how many iterations we have to pass through and the meaning of a handful of specific psychological signifiers. Unlike Dirty Pair: Affair of Nolandia, which I once compared to “Frame of Mind” long ago and far away, there's never any genuine doubt cast here onto the true nature of observable reality, it's always just a matter of getting to the bottom of the mystery that's caused things to go all meta-Lynchian and freaky this week. Even when compared to the utterly sublime dreamworld symbolic logic of Braga's own “Birthright, Part I” a few weeks back, “Frame of Mind”'s hook of “Riker wakes up in an insane asylum and doesn't know how he got there” feels fairly straightforward and almost simplistic. Which kind of makes sense once you learn that this was the exact one-sentence pitch that popped into Braga's head randomly and that he wrote in about a day for Michael Piller when the script they were supposed to be shooting that week fell through. This is not to say, I must emphatically stress, that “Frame of Mind” is at all overrated or ineffective. There are some utterly brilliant bits of abstraction and dream logic here, Frakes is so outstanding and the story and its accompanying mood are conveyed so expertly it's an absolute pleasure to watch on its own merits. I love how the structure of the teaser frame's Riker's psychic torture in terms of the play (which even shares the name of the episode itself) and sets up the narrative misdirection: We first think Riker may actually be in an insane asylum, and that the doctor sounds suspiciously like Brent Spiner is just all the more tantalizing. Then it's revealed to be all just a performative artifice (but then again, isn't everything? ), until we see Suna and cut to credits. Paralleling Riker's fractured psyche with his role as an actor (diegetically and extradiegetically) is a clever touch and, naturally, reinforces the latent performativity of the show and the series. My favourite bit comes in the climax where the play and asylum realities converge and Riker finally confronts Suna...With ad libbed lines from the play. As he starts to finally figure things out, the applause of the audience, his friends and colleagues, increase their applause to a standing ovation. Although Star Trek: The Next Generation has dabbled in it before, “Frame of Mind” marks something of a thematic shift towards more overt psychological darkness that will become more of a theme in the remaining season and a half. At first glance, this sounds like nothing so much as a straight road direct to Grimdark City: Deanna even tells us outright that “sometimes it's good to get in touch with your darker side”. But Brannon Braga is a cleverer writer than that, and falling prey to that temptation is something that Star Trek: The Next Generation is now more or less beyond the reach of It's not *quite* immune to it, grimdark is still Ron Moore's favourite old standby let's not forget, and Naren Shankar can go either way, as next week frustratingly shows. But on the whole, this side of the team has essentially put grimdark behind them. And “Frame of Mind” is doing something way cooler: Instead of wallowing in negativity, one way to read this story is actually a more graphic and explicit version of what we've just seen recently in stories like “The Chase” and “Emissary”: It's about acknowledging and making peace with the self-doubts, regrets and anxieties of our past so that we might heal from them and go on to something new. ...I know when phrased a certain way that still sounds a hell of a lot like grimdark, but I maintain there's a very thin line between them: One is about acknowledging the existence of negativity as part of a healing process to move beyond it, while the other is a voyeuristic, fetishy fixation on it at the expense of everything else with only the hollow pretense and facsimile of character development. One is drama, while the other is the simulacrum of drama. The real thing and its spectacle. This of course begs the question: What “inner darkness” does Will Riker have to confront? What we know of his past seems fairly tame-He doesn't have a great relationship with his father, but that was cleared up four years ago. His stalled realtionship with Lyrinda Halk seems like it'd be a pretty major regret for him that would have caused him a lot of pain, but they too have seem to have patched things up (and I don't care what anybody says, I still ship them and consider them an item offscreen). And the stuff we get in this episode seems pretty localized and can be chalked up to external factors. Or...can it? Because it seems pretty clear to me that this episode is telling us that Will's personal hell is being trapped in a play, being forced to recite the same programmatic mental anguish over and over again. That's not a comment on Beverly's skills as a playwright, but it may very well be a statement about the material reality of Star Trek: The Next Generation. Will is tortured by the performance of psychological drama. He's stuck in longform scripted drama, subject to the whims of an audience who wants to voyeuristically leer at someone else's misery and writers who gleefully provide that to them for entertainment. 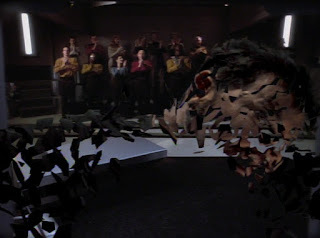 Will's torture is grimdark itself, and as the empathic voice of the crew his torment is that of the entire Enterprise. Look at how during the climax, Will's reality literally “shatters”, as if a mirror or camera lens has been tossed to the ground and cast aside. “Frame of Mind” is the next step in Star Trek: The Next Generation pushing against the boundaries of its own existence, aching to transcend to something greater than what it's been allowed to become. One can hardly blame it given the maddening amount of half-starts, unfulfilled potential and neglect it's been subject to over its life to date. But the fact it does seem so keen to break free is another sign it's not quite ready to yet. For true enlightenment only comes through the understanding of reality's true divine nature. Our lives are to be sublimated, not transcended: We've left behind the panicked adolescent urge to retreat and refuse in the face of reality's frequent uglinesses, and now we must learn to grow out of our mournful, nostalgic yearning to escape. As the Enterprise itself knows, the solution is to be the change ourselves. I like the notion that while conventional fandom likes to peg Riker as a second Kirk-figure, what we get here after several years of promising but flawed attempts is actually Frakes as a second Shatner-figure. The double-artifice of the play here is very Shatner, as is the exploration of inner darkness even in a pretty open and bright guy, the psychological bits, even the play itself as a framing device seems somewhat "Conscience of the King". It's as though Frakes knew all along that he didn't want to ape the perceived Kirk, he wanted to borrow from the slightly wry awareness Shatner's performances had, and here's where it pays off for a whole episode. That said, I keep falling asleep in this one, too. I've watched it thrice now and only made it halfway or less. But I think it's because this episode is well-trodden ground for me. I've experienced this hour a few too many times for it to keep my interest. More than somewhat "Conscience of the King"--the climax, in which every line is both part of the play and part of the "real" action, is a clear parallel. It occurs to me that we could make a case for Crusher being as magical as Guinan. It's just that where Guinan's mastery is over time, which is to say the narrative, Crusher's is over performance and artifice. That's a really interesting idea to look at in the context of the next TNG episode. Not sure we'll be able to draw much out of it other than superficialities, but still. The thing that I always found really striking, as it was the first time I think I'd ever seen it, was the triple misdirect. Like, everyone knew up-front that it wasn't going to turn out that the Enterprise was all a dream and Riker was really in a mental hospital the whole time. But as a result, we're primed to assume that the Enterprise sequences are real - but then they keep getting more obviously unreal. Okay, you think, so the mental hospital is real, but it's Evil and they're gaslighting him, and the enterprise bits are Riker's real memories trying to assert themselves but it's all messed up because he's been brainwashed or something. But _then_ at the last minute there's the third level of misdirect where it turns out that _neither_ of them is real. And they never even actually bother with telling us the story of the "real" situation - we only really get the thinnest of outlines of how Riker ended up getting mind-probed. Because that's just not what the story is about. "Pretty much nowhere else are you going to get a 200-level course on Jungian psychology and dream theory told through a mini piece of abstract sci-fi cinema on primetime television." Utterly *love* this one again - what a wonderful piece of television. This blew me away when I did my re-watch last year, and I love the idea of TNg attempting to shatter its reality and break beyond its TV bounds.